Dubai, United Arab Emirates (15 March 2018) – Nissan’s e-POWER electric powertrain technology, which helped make the Nissan Note Japan’s best-selling compact car last year, has won a prestigious Japanese environmental award for its contributions to reducing CO2 emissions. The Energy Conservation Center Japan (ECCJ), an organization backed by Japan’s Ministry of Economy, Trade and Industry, awarded e-POWER its Chairman’s Prize as part of the Energy Conservation Grand Prize Awards for fiscal 2017. Nissan first introduced e-POWER on the Nissan Note in Japan in November 2016. The company is working to launch more electric and e-POWER models globally as part of its Nissan Intelligent Mobility vision for changing how vehicles are powered, driven and integrated into society. In Japan, Nissan will release a version of the popular Nissan Serena minivan outfitted with e-POWER technology this spring. 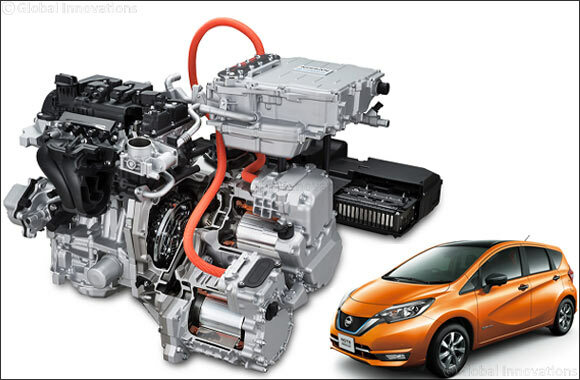 The Nissan Note e-POWER is driven by an electric motor that’s powered by a gasoline engine. The 100% electric motor drive system treats drivers to powerful acceleration, quiet operation and exceptional fuel efficiency. The role of the gasoline engine is strictly to generate electric power. Because this engine always operates at its optimum condition, the Note e-POWER boasts 30% better fuel efficiency than cars powered by conventional gasoline engines with similar output＊. The Note e-POWER’s fuel economy rating of 34.0km/L** exceeds 2015 fuel economy standards in Japan by 97%. The Note’s e-POWER Drive mode allows the driver to accelerate and decelerate using only the accelerator pedal. The regenerative brake system also helps improve fuel efficiency by charging the battery. The Nissan Note e-POWER has proven popular with Japanese customers, posting sales of more than 100,000 vehicles as of October 2017. The Note, including the e-POWER version, was the top-selling compact car in Japan in calendar year 2017. The ECCJ promotes energy conservation and raises awareness by recognizing programs, products and business models with exceptional energy-saving features.